Select an Agent Name from List & Click on Connect. And your PC will be connected to Impression Systems Server. Then we will be able to give you ONLINE DEMO / SUPPORT. You can disconnect the connection at any time by clicking on Disconnect button available on above Clients Panel. Very easy to use at Client's site. No installation, just run as an exe file. No need to ask/enter ID / Password etc to connect client PC. 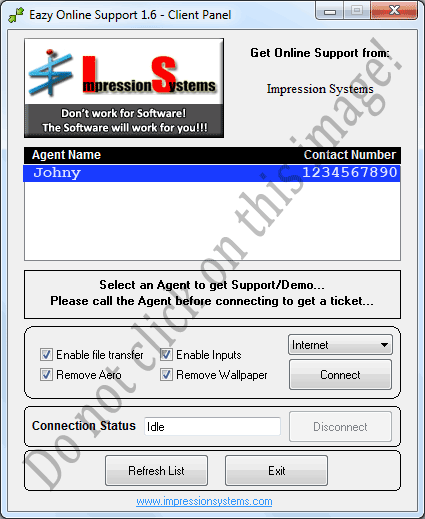 Client will select Agent name to get support / demo. Connect to multiple agents simultaneously on LAN/Internet. File transfer, Keyboard / Mouse enable/ disable options for clients to keep their privacy.